This page provides an overview of the 2014/15 Estates management collection (C14042). This should be used alongside the C14042 coding manual, which provides more detailed, technical information about the collection. What is the Estates management stream? The Estates management stream collects data about the estates and related attributes of higher education providers. Details of what information can be returned to us are included in the Coverage document found in the Coding manual. Where can I find further help with the Estates management record? Who are Liaison? The data collection system for the C14042 collection, as well as Minerva, is governed through our Identity System (IDS). The Estates management record contact for each provider will have access to the data collection system and through IDS will be able to invite additional colleagues to also have access to the system to submit data and view reports. A reminder to please not bookmark the template webpages as this will prevent you from being able to save the data. You must log into the data collection site each time when entering data. You are reminded that some data items are automatically calculated in the web form as a sum of other data items. However, if one of the component fields is left blank, the automatic calculation cannot complete and the item will remain blank (null). Similarly, ratios cannot be calculated where one or more of the component parts of the calculation remain blank (null). In these situations, if appropriate, the override function should be used to fill in the aggregated figure. Where the data is not know, you should ensure that you do not complete data items with a zero value in order to make the calculation run. Within the Estates management record there are distinct and important rules that should be followed about how to treat unknown or zero data. Null data = data items for which a value may exist but you do not know the value or have chosen not to return it. Where you have data items that meet this definition they should simply be left blank and not completed. This may mean that automatic calculations within the form cannot run and in such cases the provider should override the calculated data item if appropriate. Zero data = data items for which you know the value and the value is zero or for the data items that are not applicable to your provider. For such data items a '0' should be returned. The record contact is the first point of communication during data collection. If these details change please ensure you notify Liaison to prevent any delay in communications. Within the data collection system, Estates management users are provided with the ability to preview the Finance data values that will be uploaded into the Estates web form as they are submitted as part of the 2014/15 FSR return. This facility can be accessed from the ‘Preview FSR figures’ link situated in the 'Reports and Downloads' section of the Estates submission page. Please note that this is a live preview and the figures are subject to change whilst the Finance data collection is open. The Estates management collection contains data originating from both the Student and Finance returns. Please ensure you liaise with the colleagues responsible for completing these returns in order to ensure consistency of reporting. The Estates management collection also includes health and safety and fire data. It is recommended that you liaise with the colleagues responsible for collecting this data for completion of this section. New conversion factors for energy emissions are available for C14042. The conversion factors are based on total GHG and the Defra conversion factors and guidance page provides the conversion factors as well as supplemental information. Providers should use the 2015 DEFRA conversion factors for C14042. Ahead of the collection opening, providers are invited to send to us a summary report of any significant changes to the estate during the 2014/15 reporting period that are relevant to the collection. This report will help to inform data quality checking and analysis. This is optional; however providers who wish to provide a summary report should do so via email. Users have experienced problems when saving the webform in Internet Explorer 9 and 10. We would recommend using a different browser version when completing the Estates Return. The field FRMCOOE is showing incorrectly in the Preview FSR Figures report. The figure is correct in the webform and other reports. Prior to 21 January if you went into the Space Measurement section after completing other forms, please be aware that your residential data may not have been saved. If the SRESPT field had not been completed, this was causing issues with the residential fields. This issue has now been fixed. Select 'Enter Data' on the progress bar. The web form is divided into 6 sections and is pre-populated with data from the previous three years for reference. Select the appropriate section name in order to begin completing data items for that section. The sections can be completed in any order and progress can be saved at any point. When entering data users should note that validation is built into the form and will be applied as the form is being completed. Errors will be displayed in the 'Notifications' column and these will need to be rectified before the institution is able to pass the Commit stage. When completing data items it is necessary to state whether the figure provided is accurate or is an estimate using the radio buttons. IMPORTANT: the system will default all data items to accurate so the user will need to change this setting where appropriate. Accurate is interpreted as being within a tolerance of 5% and estimate within a tolerance of 15%. If the validation finds errors in the webform the error icon below will be displayed in the 'notification' column. You should review errors (and warnings if any), make any necessary corrections to the data and save the changes. This is the error icon. You will encounter this icon in the 'notifications' column on the webform if a data entry fails validation. To save the webform you will need to resolve all errors in the 'notifications' column. You should review any validation warnings in the webform to ensure that the submitted data is genuine or correcting and resaving the data where necessary. This is the validation warning icon. You will encounter this icon if a mandatory data entry is not completed or where the validation raises a potential issue. To successfully proceed to commit-level validation all of the mandatory data items must have been completed and any errors resolved. The data will then be classed as committable and the option to process a COMMIT transaction will be made available in the progress bar. The TEST COMMIT facility, which is available throughout the data collection period, allows you to process a transaction which will generate the commit stage reports for local scrutiny. These reports are for you to use only and will not be checked within HESA. Providers are strongly encouraged to make use of the TEST COMMIT facility as part of their data preparations. TEST COMMIT serves as a useful interim facility in the data collection process. The facility enables you to view the commit reports and assess submitted data for anomalies before processing a full COMMIT to be scrutinised by us. Select 'Test Commit' on the progress bar. The HESA data collection system assumes the submission represents the provider as a whole and runs COMMIT level checks. Preview Finance Figures: Preview of static data from the Finance return. The Summary Report shows all the data entered into the web form for each section in a read-only format together with the percentage of completion for each section and the percentage of mandatory items completed. This report contains a 'download to Excel' option. The Ratio Report is broken down into sections and contains the ratios that have been calculated from the data submitted. This report contains a 'download to Excel' option. 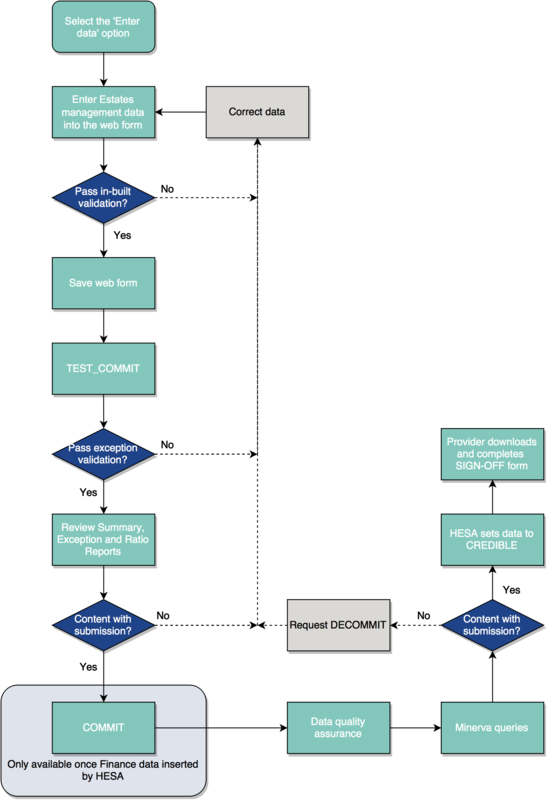 Following a successful TEST COMMIT transaction providers do not have to contact HESA to 'DECOMMIT' the return; changes can be made to the submission by updating and adding data in the normal way. If the submission fails COMMIT level checks, review the errors in the reports produced. Make corrections to the data and resubmit it. The failed TEST COMMIT transaction does not need to be DECOMMITTED. i. What to do if the file fails TEST COMMIT? If the data fails the validation, you should review the reports produced, make any necessary corrections to the data and resubmit it. Your quality rules report will be available following COMMIT-stage validation. Click on the quality rules report to review the errors triggered by the file. Make any necessary amendments to the data and process another COMMIT or TEST COMMIT transaction. To assist you with your amendments, the quality rules report features the option to download all errors or warnings triggered. Quality Rules reports are retained for all commit transactions enabling you to assess variations in levels of errors and warnings between transactions. ii. What to do if the file passes TEST COMMIT? If the file passes TEST COMMIT it will generate the suite of commit reports. These reports should be reviewed to ensure that the submitted data is an accurate reflection of the provider's profile. What is the difference between TEST COMMIT and COMMIT? In terms of the validation processes run by the system there is no difference between these transactions. The only difference between the two transactions is that the reports generated from the TEST COMMIT transaction are for provider use only. The facility enables you to view the commit reports and assess submitted data for anomalies before processing a full COMMIT transaction to be scrutinised by us. Following a successful TEST COMMIT transaction providers do not have to contact us to 'DECOMMIT' the return; changes can be made to the submission by editing the webform in the normal way. Once your file has passed TEST COMMIT and you are content with the data contained within, you should process a COMMIT transaction. This transaction will then send a copy of the submission to our Data Quality Analysts for us to undertake analysis of the return in parallel with you conducting your own analysis. The COMMIT option will only become available once the Student and Finance data has been incorporated by HESA. A passed commit transaction will lock the system to prevent the data from being amended, in order to allow our Data Quality Analysts to undertake analysis of the submission. To unlock the system you will need to request a DECOMMIT transaction from us. This will reverse the current commit and allow you to reopen the webform and amend the data. I need to amend my data, how do I get it decommitted? You will need to contact Liaison either by email or on 01242 211144 to request a decommit transaction. Remember that you need to process and pass a COMMIT transaction in order to meet the requirements of the commit deadline. A passed test commit will not satisfy the requirements of this deadline.